The group of the fauves is not homogeneous and lacks of a defined programme, but for their opposition to the Art Nouveau decoration and the formal consistence of the Symbolism. 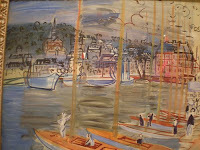 Members of this group are Matisse, Marquet, Dufy, Derain, Braque, and Vlaminck. They were nor afraid of their lack of popularity or the scandal, they did not follow a political flag and their social polemic was implicit in their poetry. Even if they conceived the art as a vital impulse, they started depicting some subjects in a critic way. Far from Cezanne’s synthesis there was just one possibility: to solve the dualism between the feeling –the colour –and the construction –the plastic form, the volume, the space –putting special strength on the colour. Their main objective is the pursue of colour with a plastic-constructive aim, as a structural element of the vision. 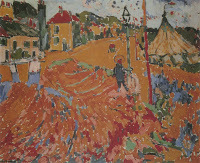 Some of them dissolved the image, following Van Gogh or Signac tend to make evident the additive process, the structure of the image and they use spare brushstrokes, evident, distributed with a certain order and rhythm that give sense to the mater, the colour and the material construction of the image. The group appeared in France between 1903 and 1907. Their style is vigorous, far from any academic principal. Their characteristics are: lyric and expressive character expressed through the colour; attempt to conciliate real and interior world; they look for the essential and simple; among the subjects there are landscapes, fluvial scenes and lyric scenes with an important weight of imagination; they represent reality in a subjective way; they emphasize the colour with pure colours, saturated, mainly flat, underlined by the line of the contours and without any reference to the subject or the image; formal synthesis; elimination of spatial perspective; suppression of the definition of forms based on the chiaroscuro; references to exotic and primitive cultures; they created pictorial spaces based on decorative motives taken from wall papers or crafts’ pieces. Their influences come from different movements: the impressionist theory of colour, chromatic joy, daily life subjects, landscapes, interiors, portraits and still-lives. From the Post-impressionism they took the division in zones, the plenitude of colour, Gauguin’s decorative sense, Van Gogh’s vivid nature. From the German Expressionism they assumed the pure and vigorous colour, the lack of modelling, the strong and direct line, the dynamic sensuality and the subjective interpretation of the artist. From exotic cultures they took the richness of colour and formal references.